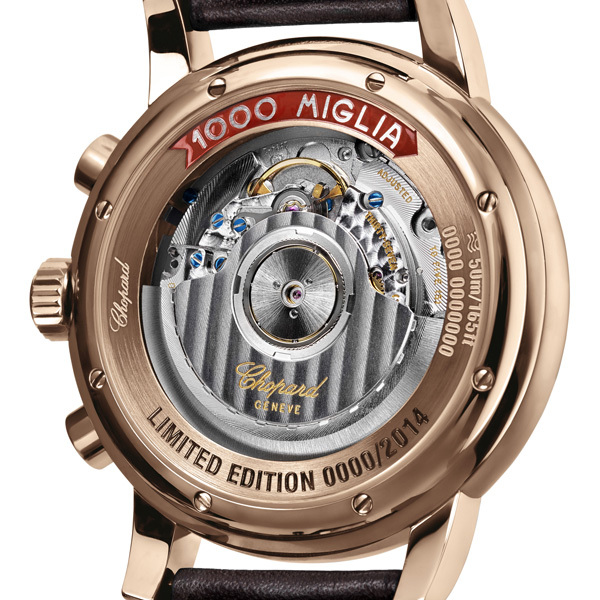 Since 1988, Chopard is partnering the “corsa più bella del mondo”. The Mille Miglia 2014 chronograph pays tribute to the historical cars taking part in the most renowned of the classic car races. With its vintage details and its gentleman’s driver-style personality, this limited edition is the most Italian of the Mille Miglia watches. 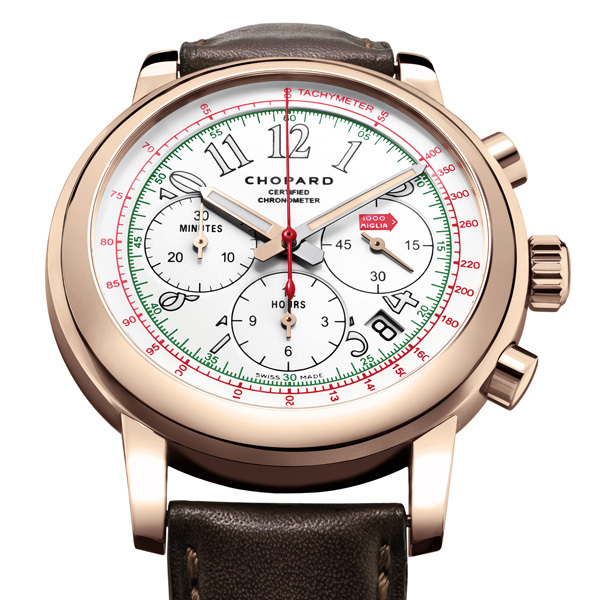 The ties between Chopard and the Mille Miglia are extremely close and have been maintained without interruption since 1988. Karl-Friedrich Scheufele, Chopard’s co-president, is himself a collector of historical cars and a competitor in classic car rallies, including the Mille Miglia in which he takes part each year. The Mille Miglia 2014 model is a chronograph featuring a design vividly reflecting the spirit of the legendary race after which it is named: it is also vintage, sophisticated, and distinctively Italian. Although the Mille Miglia has always been open to drivers and teams of all origins, it was for many years very much a primarily Italian stamping ground. Alfa Romeo and Ferrari completely dominated the podiums. The drivers participating in the contemporary Mille Miglia are seasoned collectors as well as experienced racers. They show up on the starting line in cars that must necessarily have taken part in one of the 24 original race editions run between 1927 and 1957. That is why the Mille Miglia remains “la corsa più bella del mondo”. It is spoken in Italian and experienced in Italian. The Mille Miglia 2014 carries a more distinctly Italian flavour than any of its predecessors. With its red tachometric scale and hands, white dial and green minute circle, it flies the colours of the nation’s flag. This watch is endowed with a strong character and pays tribute to the oldest cars taking part in the race, those dating from the 1920s and 1930s. That is why the usual strap made in rubber with a 1960s Dunlop racing tyre-tread motif has been replaced by a version in overstitched Barenia calfskin reminiscent of the bonnet straps on the most venerable participants in the race. The red arrow-shaped Mille Miglia logo appears on the dial as well as on the sapphire crystal case-back. 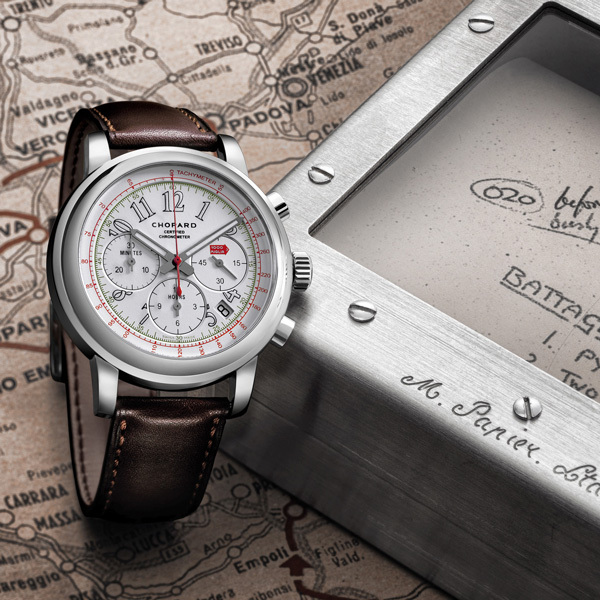 The contemporary Mille Miglia 2014 watch is thus dominated by vintage detailing. The slender cursive dial fonts are inspired by the 1920s. The lugs holding the strap are soldered rather than screwed in. This traditional technique considerably complicates the task of producing and polishing the case of this model. Radiating an undeniably masculine aura, this limited edition of 2014 pieces in steel and 250 pieces in rose gold all feature reasonable dimensions. At 42 mm in diameter and 12.30 mm thick, this is a watch that is discreet in both size and spirit. 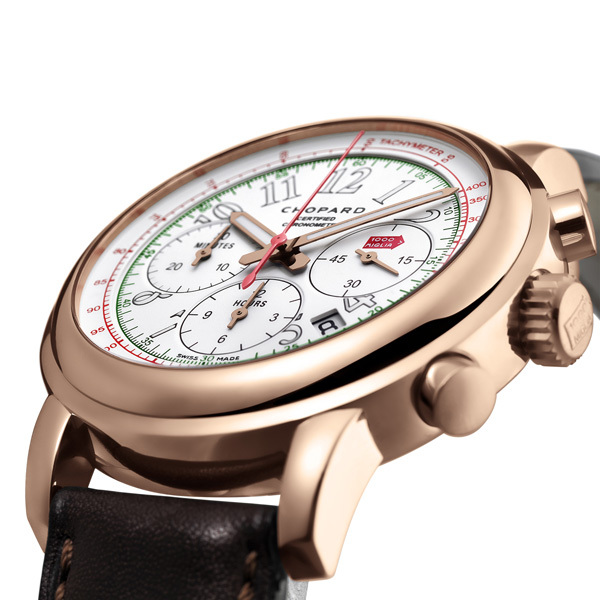 The Mille Miglia 2014 is equipped with a self-winding chronograph movement. Chopard ensures its performances by submitting all its movements to the COSC (Swiss Official Chronometer Testing Institute) which guarantee their precision - because good looks are not enough. While the Mille Miglia race is indeed impressive to watch in terms of the beautiful vehicles taking part, it is also awarded by very discerning criteria involving peerless precision and technical mastery. In the same way, the Mille Miglia 2014 shines as much by its outward aesthetic appeal as by its rigorous mechanical heart.